Henry Horn wears navy blue and optical white high top Converse “Chuck Taylor” All Stars in the film. Diana Amft and Reiner Schöne wear black high top Converse “Chuck Taylor” All Stars in the film. Cosima Henman wears turquoise and red plaid high top Converse “Chuck Taylor” All Stars in the film. Moritz and his mom go to stay with his grandfather after his parents separate. 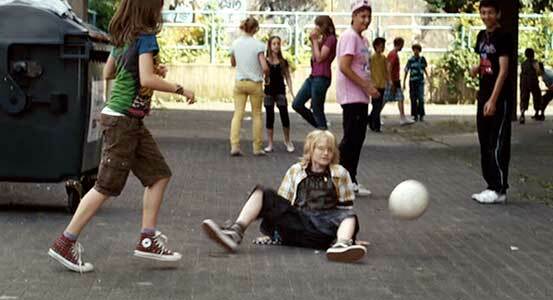 Twelve-year-old Moritz (Henry Horn) loves to play soccer, and football is his life’s passion. As the film opens, he has the perfect soccer life — his father (Benno Fürmann) is the coach for the local sports club, SV Hulstorf. We see that Moritz is talented as a player in early scenes, but he unfortunately has a tendency to space out into his own dreams of greatness at critical points in matches. When he does this in an important game, his team loses, and he accidentally kicks the captain of the other team (Tim Troeger) in the face, breaking his nose. Moritz’ mother (Diana Amft) is mostly clueless about the sport and works elsewhere. When she arrives very late at the stadium after the game is already over, she is shocked to catch her husband kissing another woman. Angry and hurt by his cheating, she immediately quits her job, takes Moritz, and leaves for her father’s house in another city. Moritz’ happy life at club SV Hulstorf is suddenly ended. Moritz has his first day at his new school. The move is tough for Moritz. He must attend a different school and find another outlet for soccer. Home life consists of living with his gruff grandfather Rudi (Reiner Schöne) who putters around the house all day and has a job as the night watchman at a nearby shopping mall, and with his mother, gone most of the time trying to find a new job. Unfortunately, the soccer team in town, VfB Eichstädt, is captained by Mark Rothkirch, the boy whose nose he broke, and managed by his father (Rudi Armin Rohde), a very wealthy and arrogant man who is also Rudi’s boss. When Rudi brings Moritz to try out for the team, Mark and the others mercilessly pelt him with soccer balls to let him know he is unwelcome and won’t be allowed to join. As he begins to get acclimated in his new surroundings, Moritz makes new friends with other outcasts, and is determined to form another team. His new friends are: Catrina (Cosima Henman), the step-sister of Mark who is quite talented but not allowed to complete by her stepfather, Mehmet (Yassine Gourar) and Enes (Kaan Aydogdu), two Turkish brothers, Niko (Sammy Scheuritzel), and a band of parkour acrobats Alex (Dario Flick), Shadow (Marvin Schlatter), Sleepy (Ben Breternitz) and Curly (Finn Ehlert), who amaze everyone with their tumbling stunts. The team finds an abandoned soccer field, mows down the weeds, and begins to practice. They bravely sign up for a new tournament even though they don’t have a coach. Opa helps Moritz up after he is rejected by the VfB Eichstädt team. Things continue to be tough for the team. Their new practice field turns out to be a construction site. Desperate for a place to practice, Moritz and the team sneak into the mall where Rudi works late at night. 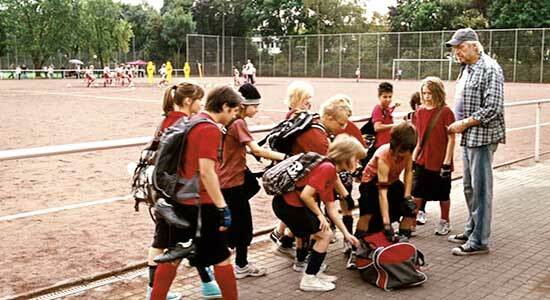 When Rudi discovers them, he is impressed by their determination and agrees to let them practice and becomes their coach. It turns out that Rudi was an first rate football player when he was young. Now things start to take off for the Devil’s Kickers, their new team name, with some great scenes of their practices in the mall using parkour techniques. When their practice field is taken away, the team practices in the shopping mall late at night. Eventually the story line falls into the usual kids sports team film clichés. The conflict between Corina and her stepfather and brother come to the fore when they discover she has been playing soccer instead of going to ballet school. Moritz’ father comes to town and wants to take his son back home, which would mean abandoning his new team. Herr Rothkirch is up to no good, trying to make sure that VfB Eichstädt will prevail in their upcoming match with the Devil’s Kickers, by firing Rudi from his job and bribing a referee. Moritz has a confrontation with the bully Mark. Underlying everything is the rift in Moritz’ family: will his parents get back together? Despite all of these setbacks, things work out in the end, as you would expect, accompanied by great soccer stunts, driving soundtracks, and cameo appearances by real life soccer stars. The Devil’s Kickers are ready for competition and get new jerseys. Three of the main actors in Teufelskicker, Henry Horn, Marvin Schlatter, and Dario Flick are members of the band Apollo 3, which makes for quite a tie in with the music soundtrack. The best performance was by Henry Horn, who the storyline is centered around. There is nothing spectacular about the acting in this film; it’s the cinematography and editing that make this work. Writer/director Granz Henman keeps things at a fast pace with some good humor and even some attempts at drama and sending messages about the proper way to treat others. Teufelskicker is meant to be a family film with most of its appeal directed at younger viewers. The film is released in DVD only in the original German without subtitles, but you can find subtitles on the Internet. Alex is telling Moritz about his troubled past. 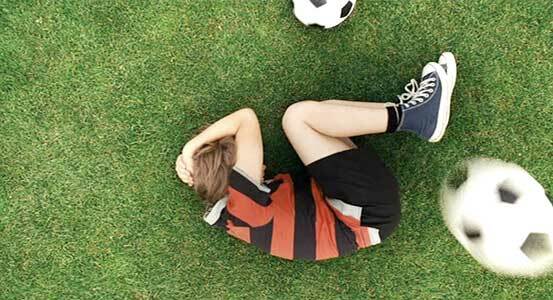 Moritz lies in a fetal position after being bombarded with soccer balls. Chucks are featured a lot in the costuming and cinemaphotography, and viewers have the delight of seeing different generations of the same family wearing high top chucks. Henry Horn in his role as Moritz likes to wear optical white or navy blue high tops when he is not in a soccer uniform, and the film is filled with many shots of him wearing chucks. Catrina, played by Cosima Henman, wears turquoise blue and red plaid print high tops in most of her scenes. Moritz’ mom and gradfather both wear black high top chucks in the film. 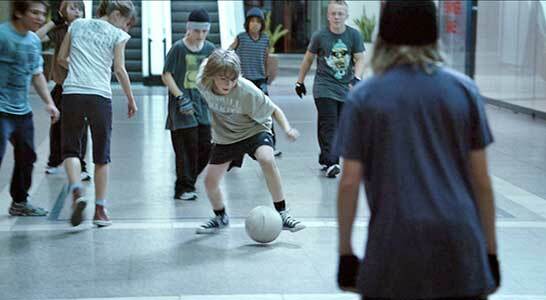 The best scenes are when the team is practicing, at school, or in the shopping mall late at night. And you feel a lot of empathy for Moritz when he is bombarded with soccer balls by the VfB Eichstädt team. Teufels Kicker (Devil’s Kickers). (2010) Henry Horn, Diana Amft, Reiner Schöne, Cosima Henman, Benno Fürmann, Rudi Armin Rohde, Catherine Flemming, Dario Flick, Marvin Schlatter, Kaan Aydogdu, Yassine Gourar, Sammy Scheuritzel, Tim Troeger, Ben Breternitz, Finn Ehlert. Written and directed by Granz Henman.